I am still looking forward to the day when there will be "Regulations for erecting signs" This morning, I walked near a sign, if it had of been dark it could of wacked me in the face, as I tried to "push" the sign higher up the pole, (which could of been possible), the plastic cable tie broke so now it is ready to trip someone up, this photo was taken on shore road with Basset road going up near top left of the photo. 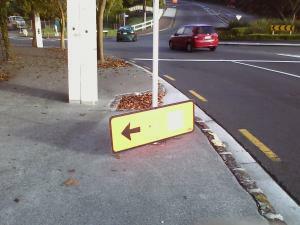 The reason why I think there should be "Regulations for erecting signs" when strong winds come to Auckland a lot of signs blow down that could cause injury. Just think how much money Auckland city council could make selling "sign erection permits" and how much more money the council could make when the signs blow down from strong winds that come to Auckland from time to time.